Farine featured Luminita Cirstea in a 'Meet the Baker' post on her website. Ms. Cirstea's courage, hard work, commitment and talent are so inspiring! I so wanted to try making Ms. Cirstea's delicious-looking (and prize-winning!) 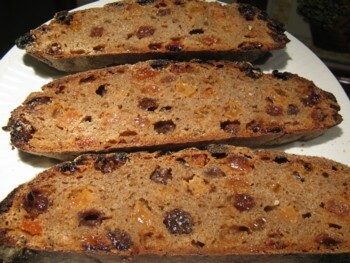 Raisin-Rye bread. With thanks to Farine for writing about Ms. Cirstea, and thanks to Ms. Cirstea for her efforts to develop this formula! 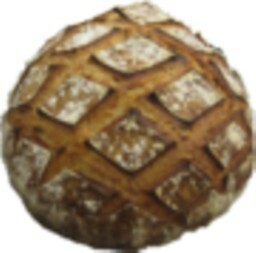 (Rye bread is new territory for me - I found lots of helpful information here on TFL posted by Andy, breadbakingbassplayer, dmsnyder, Elagins & Mini (thanks! to all)). 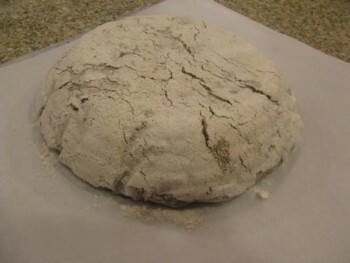 (1) Raise Liquid Levain, 12 hours at room temperature. 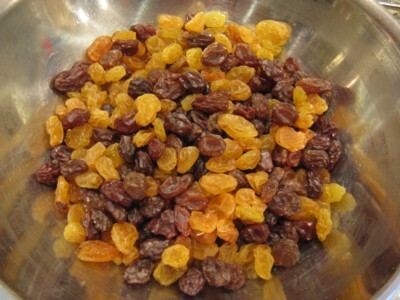 Cover raisins with cold water, soak 10 minutes, drain, keep overnight in covered container. (2) Mix Levain, speed 1 for 4 minutes. Bulk Ferment 90 minutes. 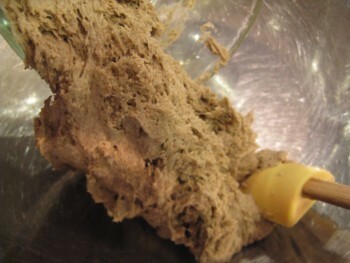 (3) Add all dough ingredients. Mix 5 minutes medium speed. 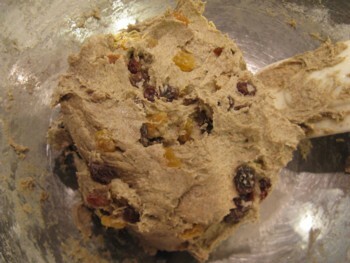 Add soaked raisins, mix low speed just until incorporated. Dust baskets heavily with rye flour. Scale by dipping your hands in warm water. This dough is very wet. Allow to proof, room temperature, 30-40 minutes. Steam heavily; vent after 5 minutes. Bake 480F for 45 minutes. 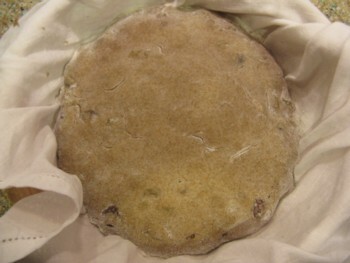 I'm including some pictures taken during fermentation (not sure if I did a proper job or not!). The second Levain was to bulk ferment for 90 minutes. 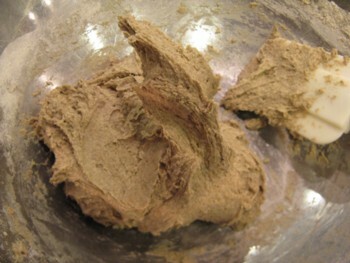 I proceeded with mixing by hand after the 90-minute bulk ferment, substituting an equal weight of whole-rye flour for the rye meal. I thought the dough was on the cool side heading into bulk fermentation (Mr. Hamelman recommends in the low 80's for a dough of this type). The dough was to bulk ferment for 90 minutes but I let it go two hours, and tried to warm the dough by raising the temperature in the proof box. 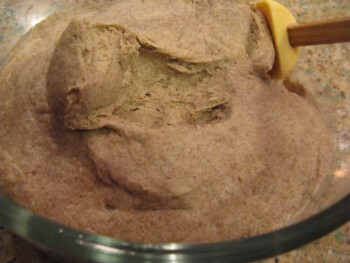 After 1 hour of bulk fermentation, the dough's temperature had increased to 78F; after the second hour of bulk fermentation, the dough's temperature had increased to 88F). The dough was quite sticky, so I didn't take a picture of the shaped loaf (my hands at that point were absolutely covered in rye paste!). I baked at 480F for the full 45 minutes and left the loaf in for 10 more minutes with the oven off and door ajar. The loaf sat for 16 hours before slicing. It's a really crusty loaf but the crumb is moist and tender. We enjoyed a beautiful breakfast this morning, thanks to this bread - the flavor is wonderful! That looks beautiful, breadsong. 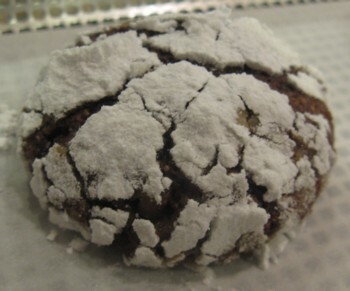 I love the cracked crust and the comparison with the cookie. Farine does such a great job with her meet-the-baker series, doesn't she? Were you able to find golden raisins without sulfites? It's not so easy, and I'm very susceptible to the taste of preservatives. Hello louie, Thank you so much. The golden raisins I bought are not organic, and sulphur dioxide is listed as an additive. The dark raisins are organic. I prefer to buy organic raisins, but the golden ones were so beautiful...I gave them a good wash before I soaked them, for whatever that's worth. I've had a hard time finding golden raisins period...but will be on the lookout for organic ones. Beautiful looking raisin bread, breadsong. And certainly a sticky dough to work with! Ms. Cirstea's formula is interesting in that there is a lot of extended fermentation for such a heavy (84%) rye. Does she explain this in her recipe? Hamelman's rule of thumb for ryes of this sort is about 30 minutes bulk fermentation and 60 minute final proof. I am discovering rye and loving it, and regret what I've missed out on all these years! "I find the 90 min. rest in step 2 a surprise to me, not that I've made many rye breads." 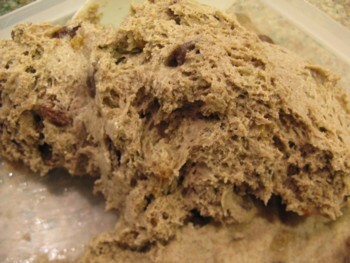 "...The first fermentation is done without the raisins and the salt percentage is low. 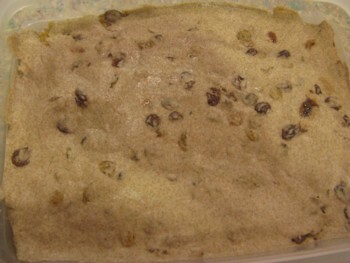 The second fermentation happens after the raisins are added. Since the raisins have a high sugar content, I add an extra percentage of salt to balance the fermentation. Finally, the last fermentation happens in the proofing baskets when the dough relaxes and this fermentation occurs at a normal rate." I'm not sure if that exactly answers your question? It's a dense crumb but still quite nice to eat!!! This looks s yum, breadsong!! Hello, Ms. Cirstea's formula with all those raisins looked so appealing, and yum is exactly right (so tasty)! I've been thinking about golden raisins ever since you did such a beautiful job baking Mr. Hamelman's Golden Raisin Bread! Thanks to you too, for your inspiration for this bread. Hello Jeremy, I apologize if the presentation of the formula is causing difficulty. I've often wondered how people presented nicely-formatted tables here on TFL. To try to improve the display of this formula table, I just spent a few minutes and managed to get my spreadsheet table (which I have nicely aligned, with borders defining the columns) into .html, which I then inserted into the HTML editor here...after updating, it looked promising, but when I saved the changes to the post the table displayed exactly the same as before. I reorganized the order of the columns, and used 'Indent' feature to right align all of the numbers in the table. If anyone has any pointers on formatting and table presentation, I'd love to learn how it can be done. I'm sure there are many ways to create a table that behaves itself, but here's one: Write your blog entry in a program that allows you to create and format tables. Most word processing programs and some text editors do. Put anything your want in tabular form, such as a bread formula, into a table. Format it as you like. When you create your blog entry on TFL, just copy your word processing document, tables included, and paste it into the TFL editor. You may lose some formatting, but the columns should line up. Hello David, Thank you so much for your reply. It never even occurred to me to use Microsoft Word to create tables, as I'm so used to using Excel spreadsheets for everything. I created a table in Word and updated the post, and the display is much easier on the eye now - thank you! I feel silly that such a basic thing eluded me but am grateful to you for mentioning 'word processing'! 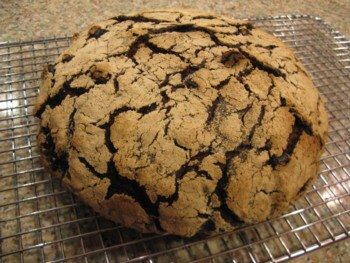 Your raisin rye bread looks very nice, breadsong! It is very interesting to see when I added some dry fruit into a dough or using mixed 2 kind of fruit yeast water, the dough rose very slow. It is like that it rises slower when you put honey in the dough that used dry yeasts?? I am very glad to see you had a great breadfast! Hello Syd, This loaf was a really good one to try; so glad you liked it.